One study showed the DTP Vaccine was associated with increased death rate of children in Guinea-Bissau. A WHO Population Council rebuttal claimed 4 vaccines including DTP were associated with increased survival rates. The rebuttal study was conducted in an district where child mortality had been very high. Before various health initiatives were made, approximately one child in four died before age 5 years. The study area was characterized by poverty, malnutrition, unclean drinking water, illiteracy and malaria. These conditions have a long history of association with high child mortality rates. The wearing of bowler hats is associated with better health. The use of cow manure on gardens is associated with healthier vegetables. The use of vaccines (injectable waste material) has been associated with lower mortality. The use of vaccines has also been associated with higher mortality and multiple modern as well as ancient diseases. Which of these associations are simply temporal, that is events occurring at the same time but without a causal connection and which associations are casually related? The wearing of bowler hats is not a cause of better health. However, in England, bowler hats were popular in higher society where the advantages of better socio-economic conditions prevailed, such as less strenuous jobs (mine owners not mine workers) and better year around diet that led to better health. Thus the association of bowler hats to health is a correct temporal association but not a causal association. The use of manure (animal waste) on gardens nourishes the soil and thus the use of manure actually causes healthier vegetables. This is a casual association. The use of vaccines (injectable waste material) has occurred along side vast improvements in sanitation and nutrition as well as hygiene, better ventilated housing and many other environmental changes. Separating the individual effects of each lifestyle change can be quite challenging, however it is well documented that sanitation and nutrition are the major factors in lowering childhood mortality and controlling infectious diseases. Are vaccines associated with lower mortality only as a temporal association, such as the wearing of bowler hats is temporally associated with better health, or is there an actual causal relationship, similar to putting manure on gardens? To understand why we can say that a published pro-vaccine rebuttal to vaccine harm did not follow standard scientific procedures, let us start with an analogy. Once upon a time an experimenter entered an area where a large number of children died before their fifth birthday. The experimenter determined that the mortality rate could be cut in half if most of the children drank a mixture of several raw vegetables made into juice and combined with small amounts of several poisons. The growers of each vegetable claimed that their vegetable was the most important one in preventing children's deaths. The manufacturers of each poison associated their poison with the 50% decline in mortality and claimed their poison was essential to the survival of children everywhere. However, the day came when another scientist found that one of the poisons actually contributed to child mortality and suggested that the overall benefit of the vegetable drink would be improved by leaving that poison out. However, none of the vegetable growers and none of the poison manufacturers would fund scientific tests to prove the relative value of each ingredient of the drink so its individual contribution to saving children's lives could be calculated. Thus the drink continued to be distributed with all its poisons included because it could be shown that the poisons were "associated with the decline in mortality," even though no causal relationship to mortality decline for any of the poisons was ever proven. the more juice given - The more lives were saved. that the more "poison" given, the more lives were saved? ? ? Could the poison be left out of the "juice" and save even more lives? That question will be examined below. The above study was followed by a World Health Organization (WHO) sponsored rebuttal using data collected on children in Northern Ghana(2) that claimed each vaccine given (BCG, DTP, polio and measles) "was associated with lower mortality" in children under 5 years. Children born in the Kassena-Nankana District (KND) of the Upper East Region (north) of Ghana between 1 October 1994 and 31 December 1999. The study sample population was 17,701 children of which 13,452 were vaccinated and 4,249 (24%) unvaccinated. Records of an additional 6300 children were not used in the study. The "vaccinated" had an uncorrected estimated average Under 5 Mortality Rate (U5MR) of 125 per 1000 live births. The "non vaccinated" sample had an uncorrected estimated U5MR of 246 per 1000 live births. As we will see below, "vaccinated" and "non vaccinated" are extremely inaccurate and misleading choices of labels if one is honestly striving for scientific facts. How vaccination takes credit for the benefits of sanitation and nutrition. Figure 1, above, summarizes the claims made by the WHO study authors. Five levels of intervention are shown with the resulting number of deaths per 1000 live births in each group. 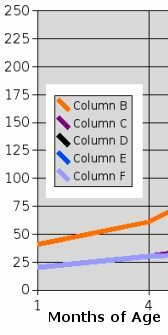 The column B (red) line shows approximately 246 deaths per 1000 with little or no interventions. Lines labeled for columns C (Magenta) through F (Violet) show a lower number of deaths associated with higher numbers of interventions (lifestyle changes) including more vaccinations. * Totals do not include an estimate for vaccine caused deaths. # No correction for self-selective healthy bias was made. What is wrong with the above figures? The only intervention for which data was given was vaccinations. A true "unvaccinated" baseline was not published. Deaths in the first 3 months of life were not published. Deaths of vaccinated children were sometimes listed as unvaccinated. Healthy self selective bias for continuing vaccination after the first in a series of vaccinations is ignored. Unfortunately, the WHO Population Council study listed only vaccination interventions into the lifestyle of families in the KND! Not listing the additional interventions that accompanied the vaccinations makes it impossible to determine what level of benefit, if any, should be credited to various vaccinations in this study. As an example, children who received the measles vaccine at 9 months of age almost certainly received a vitamin A capsule and most of the other available interventions. In the setting under consideration, vaccinations are almost always accompanied by other health interventions. See the long list below of interventions available in the study area. Historically, improvements (interventions) in the areas of sanitation, nutrition and hygiene have been the GREAT immunizers. In the USA. 90% of decline in infectious disease mortality occurred before the introduction in specific vaccines. In certain areas, like Panama, insect control for malaria was also helpful in reducing mortality. In the study area, there were improvements made in all four of these immunizing activities, sanitation, nutrition, hygiene and insect control. Typically, lacks of sanitation, nutrition and hygiene have been associated with poverty. However, no significant economic improvements occurred during the study period. In addition, health promoting lifestyle improvements were not uniformly applied throughout the KND as portions of this district are inaccessible during part of the year. The large number of non-vaccine interventions that have a high level of efficiency in producing better health and under age five survival rates make it certain that vaccination can NOT be credited with a large part, if any, of the total improvement in mortality in the subject study. Vitamin A capsules alone were credited with a minimum of 20% of the decline in mortality. See the Expanded Background Information. Yet, going completely against vaccines' proven ineffectiveness, the authors made the absurd claim that "The independent reduction in mortality associated with measles vaccination is 50 percent." This inflated claim is made even while admitting that "a mere 3–4 percent of child deaths can be attributed to measles (Binka et al. 1995)"... Keep in mind that the purpose of the study's unscientific methodology was supposedly to rebut data showing increased deaths in a population of children living in socio-economic conditions similar to the KND area and who had experienced higher mortality in response to the DPT vaccine. A list of interventions into the lifestyle of families in the KND area during the study period includes sanitation, nutrition, hygiene, education and medical treatment including vaccinations. Vitamin A supplement for mothers of newborn babies. Vitamin A supplements for children. family health, nutrition and hygiene practices were taught. and of course, vaccinations for BCG, Polio, DTP and Measles. Note: The number of Insecticide Treated Nets was low and stable during the study period. Many other educational and medical based interventions increased in the study period due to the posting of community nurses. Of interest is the fact that Measles vaccination coverage declined during this period of improving mortality. If most of the interventions in the long list above contribute to a decline in child mortality, then one or more of the interventions could actually be harmful and still the total effect of all interventions would be to lower childhood mortality. Figure 2 at the right is a subset of Figure 1 and shows mortality rates for only the first four months of life for children in the KND during the study period. Note the starting points of the red and blue lines at the lower left side of the chart. The samples of children labeled "vaccinated" had an estimated neonatal mortality (deaths in first 28 days following birth) of 20-23 per thousand and the "non vaccinated" labeled sample had an estimated neonatal mortality of twice the "vaccinated" although both groups were UNVACCINATED in the first month of life. [Our estimates based on published declines.] Why do two groups of unvaccinated children have such a wide disparity in neonatal (first month) survival? A true comparison between vaccinated and unvaccinated children must compare children whose only difference in lifestyle interventions is vaccinations. One can not legitimately compare children who receive a dozen or more interventions including a few vaccinations with children receiving no interventions and claim that the difference in mortality between the two groups is due to vaccination. The group of children who benefit from non vaccine interventions, affecting both the child and mother, have about half the rate of deaths in the neonatal period as those children who have little or no interventions. Thus if the children favored with early life non-vaccine interventions continue to receive no vaccinations, and continue to benefit from non-vaccine interventions, then their under five mortality rate (U5MR) should continue to be about half the mortality of those children with no interventions. Half of 246/1000 is 123/1000. This "estimated true baseline" of 123/1000 U5MR for unvaccinated children is less than the 147/1000 estimated deaths listed for the children (Column C) who received a partial series of BCG, Polio and DPT. 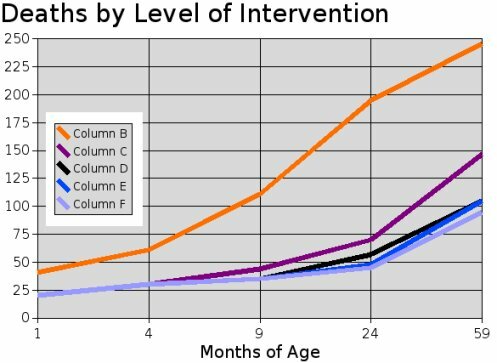 Death rates in the 1 to 4 month age were not published in the reference study; therefore, our chart shows estimates for all 5 intervention levels in this age group but our estimates do not include deaths caused by vaccinations. In a society with few socio-economic advantages, vaccine caused mortality can be very high as mentioned above for reference three. (3) Most of the vaccines other than measles vaccine were given in the first six months of life with nearly half of these vaccinations given in the 1-3 months age range in which the mortality rates were not published. The Measles vaccine was usually given near 9 months of age. We expect that publishing the mortality figures for the 1 to 3 month age bracket would increase the number of deaths in the U5MR for all four of the vaccinated groups, labeled as columns C through F.
Another major bias is due to the methodology of data collection; some children classified as not vaccinated were in fact vaccinated. Children who are vaccinated and then die are sometimes recorded as unvaccinated because the parents throw away the vaccination card that is used by the data collection team to confirm vaccination status. It would require only 18 total unpublished (Bias 3) and falsely labeled deaths (Bias 4) per 1000 life births in the 1-3 month age period to bring the U5MR of columns D and E to equal the estimated "true baseline" of the unvaccinated children. For the vaccine group that received all vaccines, there is another bias in addition to the ones already listed above and that is a self selective bias. Only 45 percent of the children received a measles vaccine compared to 75 percent for other vaccines. The measles vaccine was usually given at nine months of age, several months after the other vaccines were received and only to those whose parents voluntarily initiated a visit to a health clinic. Likely, parents who saw their children experience a severe reaction to earlier vaccines would be more likely to refuse measles vaccination for their child. Thus the group who received the measles vaccine would have been a self-selected healthier group than the children who experienced severe reactions to vaccines. For this relatively healthy group to have a minimum of 10 fewer deaths per 1000 children than the rest of their age group is likely. would bring Group F's U5MR equal to the estimated unvaccinated base line of 123 deaths per 1000 live births. Vaccinations, usually labeled "immunizations", were routinely given at the same time as other lifestyle interventions. The association of vaccines with lower mortality is purely a temporal association. NO evidence was given for any vaccine to support the idea that vaccination saved lives in the KND area. The study authors admit that the effects of the DTP vaccine in question was not seperated from the effects of the other vaccines given in the study. The published mortality rates are consistent with all vaccinations TAKING LIVES while the other lifestyle interventions saved more lives than were taken by vaccination. The published data very carefully tells us NOTHING ABOUT VACCINE CONTRIBUTION TO MORTALITY as well as the contributions to saving lives of other lifestyle interventions. The published baseline for unvaccinated children is very misleading in that multiple interventions were ignored. The true baseline for unvaccinated children who received the benefit of multiple changes in lifestyle would have been much lower than the published baseline. Thus the methodology of the study is not merely flawed but is also fraudulent. Zero Nutritional/Educational/Medical/Hygiene interventions experienced very high mortality. Minimal Nutritional/Educational/Medical/Hygiene interventions experienced medium high mortality. Most Nutritional/Educational/Medical/Hygiene interventions experienced low to medium mortality. All Nutritional/Educational/Medical/Hygiene interventions experienced low mortality, relative to the general socio-economic conditions of the district. Given what is known about the history of vaccinations, it is expected that the vaccines contributed nothing to the decline in childhood mortality. See Below. The decline in mortality occurred because of the various changes in lifestyle (interventions) and in spite of the harmful effects of vaccinations. The following notes and references may help one understand the rather condensed information given above. Trend and causes of neonatal mortality in the Kassena-Nankana district of northern Ghana, 1995-2002. "Overall, the neonatal mortality rate declined at an average of 2.5 per 1000 live births per year: Down by nearly 50% from 40.9 (95%C.I. 34.1-46.8) in 1995 to 20.5 (95%C.I.17.3-22.7) in 2002. Improved diets clearly lower mortality and even an increase in households with non-dirt floors may be beneficial. The Community Health and Family Planning Project from 1995 to 2004 includes the period of the study above. Not already mentioned immediately above are de-worming, Oral Rehydration Therapy, other home care for diarrhoea, exclusive breast feeding and complementary feeding. Preventative treatment of malaria during pregnancy, iron and folic acid supplementation and the use of Insecticide Treated Nets for pregnant women. Care for diarrhoeal diseases, antibiotic therapy and basic midwifery. Family health, nutrition and hygiene practices were taught. The field data collection and processing are mainly supported by funds from the Rockefeller Foundation, with technical assistance from the Population Council. Data are used to compile reports for the Ghana Ministry of Health, which is the major consumer of the Navrongo DSS data. 31) December 1980---Archbishop Peter Proeku Dery of Ghana reveals that "the World Bank denied loans to Ghana until my country agreed to institute a nationwide contraception and family planning policy. There was also pressure to legalize abortion, although the Church and the people have so far been able to prevent this. For how long, I don't know. The World Bank's attitude shows a total disregard for the beliefs of the people of the Third World." Some years later, Kofi Annan of Ghana will receive the approval of the power elite to become U.N. Secretary-General, and he will do nothing to stop the slaughter of hundreds of thousands of Rwandans.